Goodbye February, Hello March, Welcome I Light. 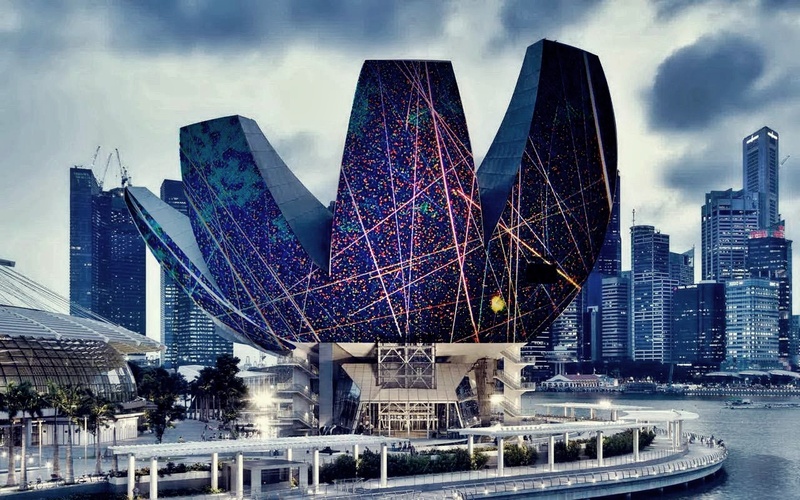 Being Asia’s leading sustainable light art festival, held in the Marina Bay district of Singapore organised and presented by the Urban Redevelopment Authority (URA), this is an event that is no stranger to Singaporeans since first held in 2010. HYBYCOZO is inspired by the marriage of science, technology, geometry, materials, and the artists’ favourite book, Hitchhiker’s Guide to the Galaxy. Taking in these far-ranging influences, the artists have borrowed from everything from ancient Islamic tiles to the patterns created by particle physicists when modelling the unified field theory to translate the appearance of beauty within naturally occurring harmonic relationships and patterns in the natural world into sculptural form. Dande-lier conveys a feeling of weightlessness by using lightweight umbrellas, turning a common object into a portal that changes the visitors’ perspective of their surroundings. The umbrella spans across scales, individually as a chandelier, and collectively as a dandelion – hence, coining the word “Dande-lier”. Within, the view of the outside world is warped, transporting visitors into an alternate world, with a smart lighting system that responds dynamically to the visitors’ position in the sculpture. Fancy a Brave moment? When a swarm of fireflies follows you through the forest - a hundred individual lights are hung overhead, lighting up and sparkling as you walk underneath them, following you. And as soon as they appear, they disappear and the sky is dark again. This piece is inspired by the fabric lace and sea urchin. Lace symbolically weaves different people and cultures, while physically, the openings in the woven surface create patterns of light against the dark sky, water and city, a juxtaposition of a permeable surface on different visual layers. Inspired by the sea urchin, the textured and permeable surface interacting with light creates openness; while the pattern’s mathematical repetition brings visual rhythm and harmony. At night, the illuminated Urchins make their occupants glow, but during the day, The Urchins interact with natural light projecting shadow patterns over the boardwalk and offer sheltering shade under the sun. Horizontal Interference is formed by a colorful cord construction which connects the trees in a simple manner. This architecture of wires, itself is already beautiful in the day, turns into a spectacular beauty at nightfall. A simple, yet ingenious illumination merges the natural and constructed elements, creating a poetic and powerful image, moving in the wind. Here in this urban jungle stands an illusory image of an immediately recognisable home using light – as if a child’s sketch or an unreal mirage among the cityscape. Home is a place of safety and a shelter, illuminating the dark and attracting stray wanderers like a lighthouse in the chaos. Northern Lights is a light-art piece inspired by the enthralling experience of the aurora borealis, the spectacular and poetic natural light phenomenon that occurs in the sky of the northern hemisphere. Using a carefully programmed light story performed through 100 vertically positioned light lines equipped with LED sources, the dynamic movement of the lights evokes a mesmerizing and poetic sensation in an unpredictable flow which interacts intimately with its surroundings. A luminescence display of flowers that glow in the dark, inviting passers-by to take a walk through the garden in the dark. Each individual unit of flower is powered by its own solar powered LED. The modular, wireless nature of the display allows it to take on a second life in people's gardens after i Light Marina Bay 2017. Light is energy, and energy gives life. Light, therefore, gives life. Beyond light as utilitarian and functional, I Light You So Much aims to share a life experience of an object using light. A kinetic installation consisting of lines and light, the installation is made out of bamboo – believed to store positive energy – and moves in reaction to the wind, and visualizes this hidden energy in the presence of light. Inspired by the natural forms of the microscopic diatoms and radiolarians found in the rivers and seas around Singapore, the Ocean Pavilion is both a space for contemplation and wonder. Constructed with upcycled plastic bottles and lit from within with energy-efficient LEDs, it is a stunningly beautiful structure of both order and an organic disorder, and a celebration of the coexistence of nature and the built environment. (Ultra) light network exposes nature’s basis as networks of energy and information flows and portrays the duality of light as luminous energy and light as immaterial quality. An ultra-light structure floats 2.5m overhead, consisting of 150 organic-shaped 3D printed nodes connected into a volumetric mesh. The presence of activity near the structure triggers dynamic patterns of light that pick up in intensity as more people approach the structure. Secret Galaxies presents a confluence of visual imagery based on the humanistic relationships with the night sky. Accessible by all and yet almost untouched by mankind, this celestial view plays many roles in our psyche and everyday lives. As we blur the hard lines that separate science, faith, art, and magic, it is through this convergent lens that we invite you to view these Secret Galaxies. Giant glowing eyeballs with colorful irises stare into the distance, and snap to attention when a visitor approaches. In a primal response, the eyeballs start to look more skittish, and attempt to “scare” the intruder away and morph into a series of different eyes to dissuade the curious onlookers from hanging around for too long. Kaleidoscopic Monolith incites curiosity from spectators through light, reflection and form. At a distance, it is perceived as a single convex form with a subtly changing profile as visitors approach; on closer inspection its rippling surface contains a pattern of concavities which distort, repeat, and reorient the context while a pattern of light on the surface surrounds the piece in an ambient, glowing pool and illuminates onlookers whose own reflections become part of the spectacle. Evoking a kaleidoscope, the colourful patterns created by the installation resist a singular meaning and instead provoke participants to discover their own allusions through interactive play. ATARAXIA is an interactive light installation that brings people from the hustle and bustle of life into another dimension. Experience a state of freedom away from anxiety and tension. Be transported to an alternate world free from feelings of negativity and pressure and embrace nature. Relocating Locality takes the form of a series of interlocking pavilions, made by materials such as wood and bamboo, amongst other found objects. By re-situating the familiar elements of fixtures from the heartlands into the manicured city centre, the work juxtaposes the DIY pavilions against the cityscape. Adding extra dimension and lending contrast to their surrounding polished environment through revealing the materials in their raw forms, the works act as mediators between the urban and the natural found in between the gaps. As the evening fades into night, the Merlion seems to breathe in the water of Marina Bay, creating a flowing and extraordinary dress made out of matter from the sea. Successive waves of seawater give the Merlion a coral dress, a surreal skin of fish, shells and other marine creatures. This endless ebb and flow of colours, images and sound come together to give shape to the Soul of the Sea. Take a break and visit the I-Light exhibition this weekend, located at Marina Bay Sands. 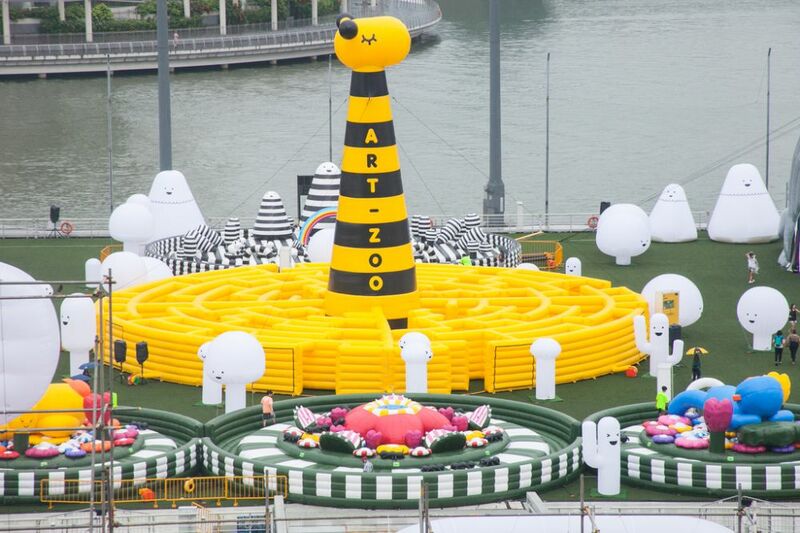 Art-Zoo Inflatable Park, a ticketed festival hub under i Light Marina Bay 2017, is a culmination of an experiential inflatable playground and art installation in the setting of a zoological garden. From plants, animals, to ecosystems, Art-Zoo is a fun and immersive world that explores nature through the perspective of art, creating an imaginative landscape that explores alphabets and animals. Art-Zoo stirs up wonder and curiosity in all of us through a very visual and interactive adventure. Art-Zoo is created to bring fun and happiness for everyone. These friendly adorable creatures are easily recognizable with simple shapes and colors. Our animals and plants are brought to life with alphabets (A-Z) that remind us that art is fun and enjoyable! 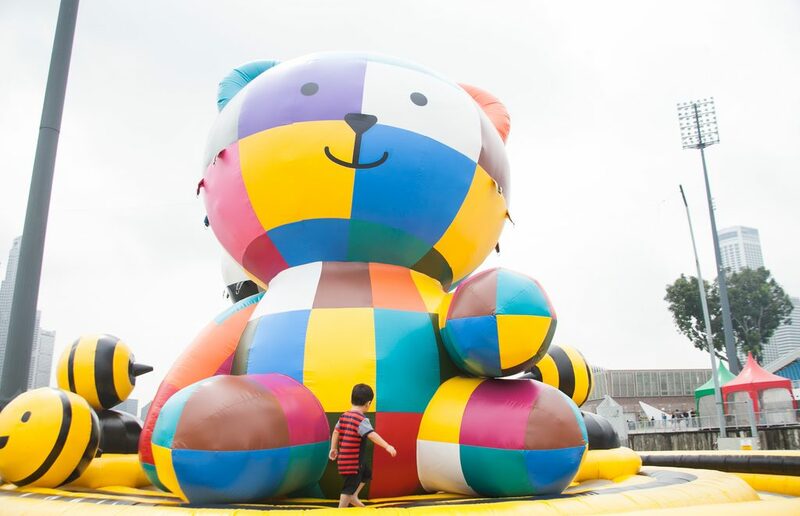 The Float at Marina Bay is located on the north side of Marina Bay at just a few hundred metres from the central business district (west) and the iconic Marina Bay Sands hotel. It can therefore easily be walked to from most central locations. For more information on how to get there, click here for Art Zoo's website. Want more money for your buck? Click here to purchase your Art Zoo Tickets at $12.99!